This is ChromLives updated 4 in 1 camera handle grip for your camera / DSLR camera / action camera / smartphone. It provides advanced Low Angles/Position Shooting System for all DSLR cameras, DV, Compact Cameras, Action Cameras with a standard 1/4 inch thread. Ideal for making low camera position videos and Images with movable scene or micro shoots. Kind reminder: Package comes without gimbal or battery. 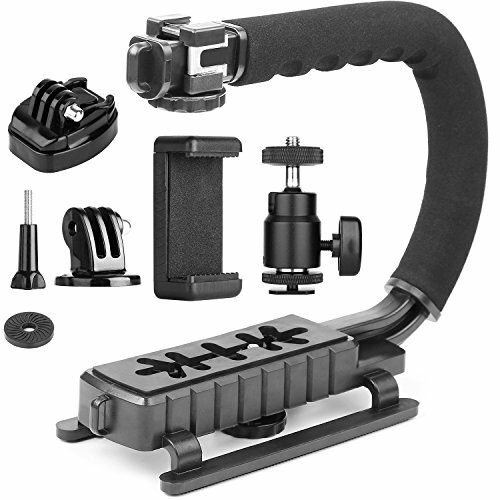 1.C shape handle grip with 3/triple detachable shoe mounts on top for attaching phone/flash/mic at the same time. 2.Universal 1/4" thread on mounting plate for all cameras camcorders,action cameras,smartphone and more. 3.Cushioned padded non-slip handle,comfortable to use for long time filming. 4.Non-slip rubber rails in the bottom for security. Adjustable phone holder clip designs for iPhone, Samsung and any smart phone with wide less than 3.55"(Not for table). (iPhone 7 Plus=3.07 inches). 1/4" thread from bottom and side allows Vertical and Horizontal photography. Cool 1/4" Hot Shoe Mount w/ a 360 Degree Swivel Ball-Head for easy direction of the flash/monitor. With 1/4" Hot Shoe Adapter, you can mount it onto virtually all DSLR hot shoe. Easily attach your gopro and other action camera and camcorder to this camera stabilizer. UPDATED- TRIPLE SHOE MOUNTS- This camera camcorder stabilizer is with 3 detachable cold shoe mount to allow to attach your led video light,flash light and microphone at the Same time! Phone Clamp Mount for Low Position Shooting- Makes perfect low position shooting by holding your smartphone as the HD monitor in Sports. Spring loaded Phone holder exceed the other design for it provides better protection for your phone and it comes with 1/4" from bottom and side for Vertical and Horizontal photography. 360 Degree Swivel Ball-Head Hot Shoe- W/ 1/4" tripod screw for mounting flash light, led light, video monitor, microphone and lightweight devices with 1/4" screw hole. Swivel Hot shoe for easy direction of the flash/monitor. GoPro Quick Release Buckle Plate and Adapter- Attach GoPro camera and other Action camera and camcorder to the Stabilizer. Perfect portable platform for GoPro / Sony / Garmin Verb XE for 4K shooting. WIDELY USE- Professional yet every body can use. You can use it in extreme sports situation like biking,skateboarding, rollerblading, surfing hunting; You can also use it for daily life to record a birthday party, banquet, travel alike.Cushioned NBR padded handle alleviates the stress of lengthy filming. Package includes 1x Camera Handle Grip,1x Smartphone Holder,1x 1/4"Hot Shoe Ball Head,1x Gopro QR Buckle and adapter screws. If you have any questions about this product by ChromLives, contact us by completing and submitting the form below. If you are looking for a specif part number, please include it with your message.